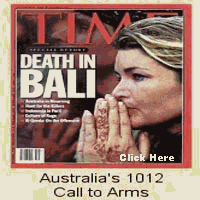 [Allegedly], however, the report did not suggest any agency had specific warnings of the Bali attack. Senator Brown says while Mr Flood highlighted some concerns about intelligence regarding JI, he has left any further investigation into the matter up to the Senate inquiry. Senator Brown says Mr Flood has more information about pre-Bali intelligence and his response is not good enough. "He's not there to defend Prime Minister Howard and his Government, he's there to enlighten the Australian people about how intelligence failed as he sees it," Senator Brown said. "I want him to come onto the record. This is a direct challenge to Mr Flood - come out and specify how that intelligence, pre-Bali, failed." 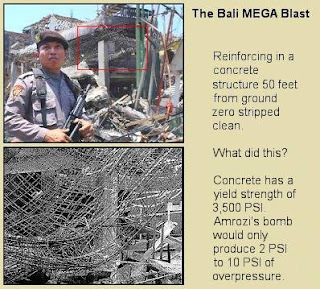 Concrete Was Stripped From Reinforcing Steel  A key indication of the force of the main blast is found in photographic evidence and eyewitness accounts of damage to a reinforced concrete building that was 50 feet from ground zero. The Fox went out on a chilly night, he prayed for the moon to give him light, for he had many a mile to go that night....Before he reached the town-o?